Masonry blocks refer to building blocks of material that include concrete blocks, bricks and stones. Concrete blocks provide strength and durability, while lasting for many years. Tying the concrete blocks properly to a concrete foundation requires adhering to proven techniques and following every step necessary. Patience is your greatest attribute when laying concrete blocks. 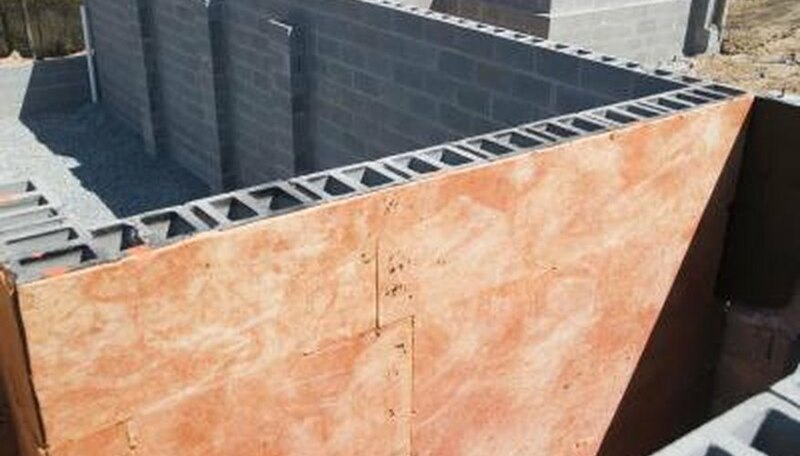 You need to lay concrete block walls that are level and in plumb, while maintaining the correct amount of mortar between each block. Mark the outline, with a chalk line, on the concrete foundation where the wall will be erected. Spray the concrete masonry blocks thoroughly with water in advance, so that they do not absorb too much moisture from the mortar. Mix enough preblended mortar in a wheelbarrow, according to label directions, to last for approximately two hours of laying blocks. Dip mortar from the wheelbarrow onto the mortar board with the trowel. Use the trowel to spread a 1-inch-thick and 8-inch-wide layer of mortar for a distance of three concrete blocks along the premarked perimeter for the wall. Work with the trowel to make a trough that is approximately 2 inches wide down the center of the layer of mortar. The shape of the trough works to direct the mortar along the outside rim of the masonry block, where it bonds with the concrete foundation. Spread a 3/8-inch-thick layer of mortar on each side ridge of one end of the first concrete block. Place the concrete block on the foundation on top of the layer of mortar. Set the mortared end of the block in position to receive the unmortared end of the next block in line. Gently tap the block with the handle of the trowel as necessary to make it level and to seat it firmly. Scrape off the excess mortar that is squeezed out onto the concrete foundation from under the concrete block, and return it to the mortar board. Mortar one end of the next concrete block; then place the end of the block without mortar end-to-end with the first block that is mortared. Tap it into place, while making certain the mortar on the bottom end of the block blends with the mortar previously spread on the foundation, to form another anchor point. Continue to lay concrete blocks using the same process to tie the blocks to the concrete foundation. Wear a dust mask and eye protection when mixing mortar. The dust is harmful to your respiratory system and eyes. Cover mortar with plastic sheeting on hot days to keep it wet and elastic. Wet the mortar board each time before using it. Masonry supplies and equipment are available at home improvement stores. Wear gloves when working with cement and handling concrete blocks.